Armel Le Cléac’h and his VPLP-designed 31.5m maxi trimaran Banque Populaire VII crossed the finish line at 00 hour, 01 minute and 10 seconds GMT this Tuesday night, 1 October, and established a new cannonball time for the Mediterranean solo crossing record in 18 hours, 58 minutes and 13 seconds. 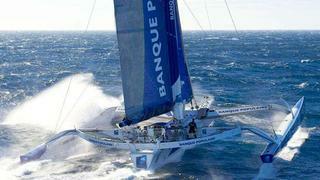 Armel Le Cléac'h left Marseille on Monday morning, after a first attempt cancelled on Sunday. This time, weather conditions were perfect, and the skipper drew an optimum trajectory to Carthage in Tunisia thanks also to his collaboration with his tactician Marcel van Triest. Armel Le Cléac’h and his 31.5m maxi trimaran Banque Populaire VII impressively smashed the former record established by Thomas Coville one year ago (25h 38'36"), improving it by six hours, 40 minutes and 23 seconds, and cruising the 458 nautical miles of the race at an impressive average speed of 23.8 knots. The 31.5m maxi trimaran Banque Populaire VII is the former Groupama 3. Sold ealier this year, she was repainted in her new white and blue colours. Designed by VPLP and launched at the Multiplast yard in June 2006, she already broke multiple records with her famous previous skipper, Franck Cammas, including the Jules Verne Trophy in 2010, in 48 days and 8 hours. Now renamed Banque Populaire VII, she is optimized for solo races with Armel Le Cléac'h, who has decided to win most of the existing records and races with her, especially the next Route du Rhum in autumn 2014.